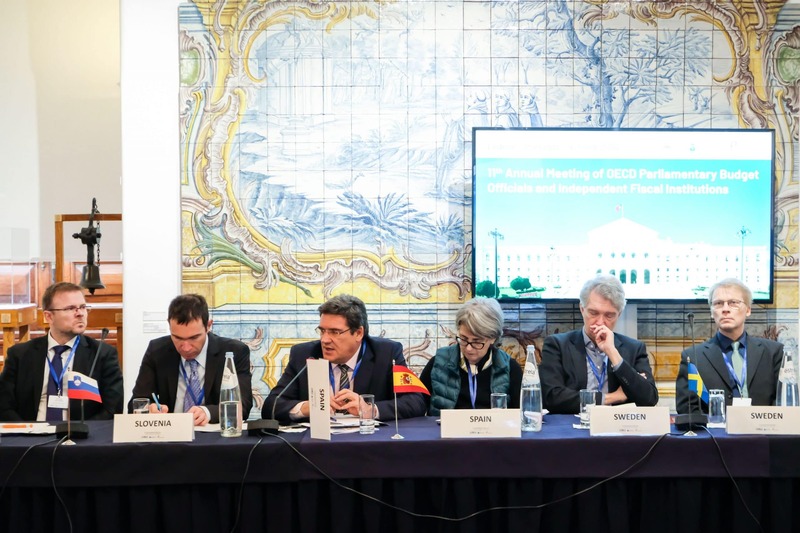 The Chairman of the Independent Authority for Fiscal Responsibility (AIReF), José Luis Escrivá, has participated this week in the 11th Meeting of the OECD Network of Parliamentary Budget Offices and Independent Fiscal Institutions, held on the 4th and 5th of February in Lisbon. The Meeting was inaugurated on Monday by the President of the Assembly of the Republic of Portugal, Eduardo Ferro; the Director for Public Governance, Marcos Bonturi; and the Chair Office for Budget Responsibility (OBR) of United Kingdom, Robert Chote. In this edition, a total of 10 work sessions have been organized, in which important issues have been addressed such as the role of the new fiscal institutions, its evolution in recent years and the best practices for fiscal and budgetary surveillance. Fiscal institutions and OECD experts have also discussed the challenges linked to the production of long-term forecasts and the OECD has presented its report about the outlook for the world economy until 2060. Furthermore, the institutions have reviewed their communication strategies. They focused on the use of social media, a key instrument of public communication increasingly common in government and political circles.. In particular, participants have analyzed the opportunities and challengesthat independent institutions will have to address. They also reviewed the results of the OECD’s evaluation of the Public Finance Council of Portugal (CFP), in which the achievements of the institution in recent years were highlighted, major short- and long-term challenges were identified and a serie of recommendations were made to guarantee the good performance of the institution in the future. In this edition, the experiences of the fiscal institutions that have recently begun to cost election platforms have been discussed. Also the strategies aiming to establish a good relationship between the fiscal institutions and the administration of each country to ensure a smooth information flow were on the agenda. José Luis Escrivá has also chaired the meeting of the Network of EU Independent Fiscal Institutions in which, , the relations with the european institutions (the European Commission and the European Fiscal Council) have been discussed, in particular the follow up of the recent Statemnte by the Network about the need to reinforce and protect IFIs. There was also a discussion about the future organization of the European Union Independent Fiscal Institutions, once the mandates of the current president and vice president end.